Exactly how to calculate ROI. How much you should calculate for expenses. The number one mistake new investors make when calculating ROI. Why you should care about NET ROI. The main goal of the course. What you can expect from the Financial Freedom Academy. How FFA can help you confront your beliefs around personal finances. The importance of working as a team within your family. The resources you can expect from enrolling in Financial Freedom Academy. On today’s episode of Investing in Real Estate, I’m sharing 5 powerful benefits of using a 1031 exchange. You're going to learn tips for saving on taxes, portfolio growth, and how to build legacy wealth. 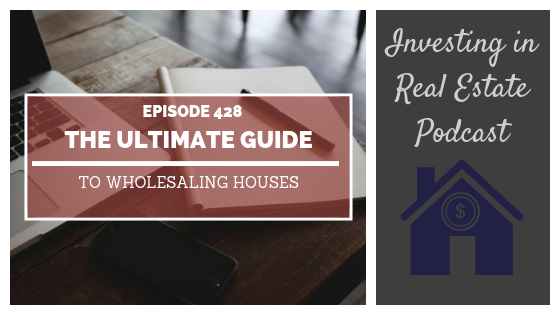 To learn more about utilizing a 1031 exchanges, listen in to episode 426! How a 1031 exchange can help you upgrade an asset. How portfolio diversification can occur when taking advantage of a 1031 exchange. What happens to the taxes after the investor’s death. Why a 1031 exchange can be a long-term strategy. How to grow your portfolio with a 1031 exchange. If you’ve ever wondered what it would be like to buy your very first turnkey rental property, today’s show is for you! On this episode of Investing in Real Estate, we’re bringing you a case study episode with new investor, Dan. Dan is a therapist based out of Pennsylvania, who, along with his wife, made some major life changes in order to build wealth. On today’s show, he’s sharing the details of his first turnkey rental property and what it was like to set up his LLC. We’re also discussing what he’s learned about investing, and his plans to grow his portfolio! Dan’s story is so inspiring; you won’t want to miss episode 425! How Dan got inspired to begin purchasing assets. What Dan did with the profits from the sale of his home. How Dan and his wife had to change their mentalities about wealth building. The tax benefits of owning rental real estate. What it’s really like to buy a turnkey rental. Dan’s plans to expand his portfolio. Section 8 is a government program that helps low income tenants with their housing costs. As a landlord, renting under Section 8 has its pros and cons. However, there are many misconceptions out there about the process, and what these tenants are actually like. On this episode of Investing in Real Estate, Natali and I are sharing our experience renting to Section 8 tenants. We’ll discuss how to become certified, some of the pros and cons, and what you can expect from the process. Please join us for episode 424! The truth about common Section 8 stereotypes. How to certify your property for Section 8. The pros and cons to renting to Section 8 tenants. The two ways to become a Section 8 landlord. What to expect from a government inspection. Some of the additional hoops you might have to jump through. Why it’s important to work with a property management company.